The remake of the 1981 horror comedy film landed a distribution deal. A remake of the film first hinted at by star Bruce Campbell this summer looks like it might actually materialize. The new Evil Dead is produced by Raimi, Campbell and the original's producer Rob Tapert, but it will be written and directed by Fede Alvarez - with some help by Juno writer Diablo Cody. The remake will star a new set of teenagers in an isolated cabin who discover the Necronomicon, or the Book of the Dead, and become haunted by an other-worldly being. The new Evil Dead will be distributed by Sony Pictures and will hopefully go into pre-production soon. "For 30 years, Sam, Bruce and I have been looking for the right home where we could return the deadites to the big screen," said Tapert in an announcement. Sony and the rest of the production team "share our passion for great storytelling as well as our obsession for scaring the pants off the audience. Together, we are looking forward to terrorizing a whole new generation." Evil Dead was a landmark film in many ways. It put director Sam Raimi on the map, for one, and the shaky cam technique he pioneered in the film was soon widely adopted by Hollywood. Friends of Raimi from the Minnesota area aided in the production whose names you might recognize - Joel and Ethan Coen. And of course, Evil Dead made Bruce Campbell a household name, at least if you loved Brisco County Jr., currently watch Burn Notice or love his cameos in Raimi's Spiderman movies. 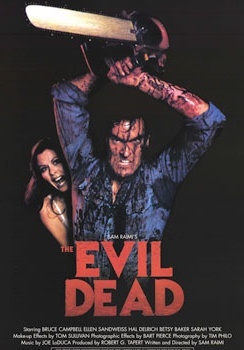 In some ways, Evil Dead 2 was already a remake of the very independent film-ey original but with better production value and the awesome scene of Bruce Campbell cutting off his own hand with a chainsaw. The series diverted into campy fantasy/horror with 1992's Army of Darkness, as Bruce Campbell's Ash was transported back in time to the middle ages to once again fight zombie-like "deadites". Army of Darkness is by far my favorite film out of the bunch with great one-liners delivered unforgettably by Campbell - "This is my boomstick!" - so let's hope the remake does well enough at the box office and we get to see what happens to Ash when he returns to work at his dead-end retail job. Shop Smart. Shop S-Mart. You got that? !